Polish, Portuguese, Russian, Spanish, Simplified & Traditional Chinese. 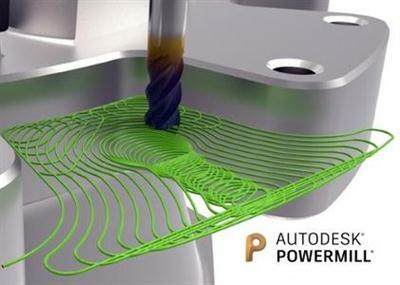 Autodesk Inc., a world leader in 3D design software for entertainment, natural resources, manufacturing, engineering, construction, and civil infrastructure, has released an update to PowerMill 2018. This software provides comprehensive milling strategies for high-speed and 5-axis machining. Get tools for manufacturing molds, dies, and complex parts. - Fix a major bug with workplane angles not output in 3+2 toolpaths. - Area clearance toolpaths involving flat extensions now more reliable. - Fix a potential crash in centreline toolpaths (detected via Customer Error Reporting). - Ctrl+P shortcut now works as expected. - The list of workplanes wasn't correctly updated after a workplane was created, edited or deleted in PowerMill. - A global workplane has been added, which defaults to PowerMill's transform when no workplane is active. - Various options are now set to default values instead of empty boxes. - Work offsets are now correctly set. - Simplify the user interface for block selection to make it less confusing. - Simplify the user interface for setting a stock transition workplane to make it less confusing. - External thread milling now orders cutting passes from outside in rather than from inside out. - Reduce the amount of memory consumed when calculating centreline toolpaths. - Fix a crash when calculating a clone of a toolpath which was limited to a boundary and was subsequently deleted. - The `Turns` parameter for external thread milling can now be set to values less than 1. - Fix a potential crash in corner machining (detected via Customer Error Reporting). - Fix a crash and a failure to calculate toolpaths using automatic collision checking and negative thickness. - Fix a crash when calculating pattern finishing and surface projection toolpaths with a user-defined tool axis and flat bottomed tools with no radius component. - Better determine when multi-axis connection moves between toolpaths in an NC Program should be output. - Fix a crash when simulating an NC Program with a workplane at the end and tool changes set to occur before connections. - The simulation of drilling toolpaths now respects the toolpath's orientation vector. - Child items in hierarchical models should inherit their parent's attributes. - Do not offer to reimport models when batch processing. - Fix a bug where reference models were being read back as machinable models. - The 'Select by' list will no longer show duplicate entries due to the fact that they match multiple criteria. - Fix stability issues relating to progress updates (detetected via Customer Error Reporting). - Fix some untranslatable strings in the user interface. - Further work to speed up opening of strategy dialogs. - Fix an issue where a tapping tool was losing precision after entering its pitch value through the user interface. - Ensure that the Tool.Status parameter accurately reflects the status of the tool as displayed in the user interface. - Fix a bug where the F3 keyboard shortcut was always reverting to plain model shading, rather than remembering the last known shading type. About Autodesk PowerMill 2018. The major new update for PowerMill is a ribbon-style user interface, which is something the team has been working on since Autodesk acquired Delcam in 2014. You will still be able to easily find and access important tools, but the 2018 version categorise functionality into similar groupings, with the most commonly used features front and centre. The new interface is designed to provide an improved user experience and help shorten the learning curve. Autodesk PowerMill 2018.1.4 Update | 164.8 mb download links are provided by Extabit Rapidshare Uploaded Rapidgator Netload Bitshare Freakshare Letitbit Dizzcloud and more.